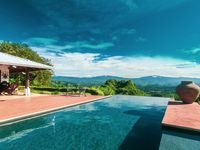 Properties in Costa Rica average 4.7 out of 5 stars. Lake Arenal: Lake View,Location,Wildlife,Pool,Wifi, King Beds! Property 9: Lake Arenal: Lake View,Location,Wildlife,Pool,Wifi, King Beds! Property 11: On the Beach. Casita Del Mar is a Studio - Sleeps 2. Great Reviews. Private. Property 12: Luxurious oceanfront condo w/ breathtaking view & shared pool - walk to beach! Property 17: Mountaintop Views, Serenity & Privacy Near Atenas, Close to Pacific Beaches! Property 18: Atenas: Secluded, Secure, Gorgeous Mountain View, Pool! Beautiful Condo steps From both Tamarindo and Langosta Beach! Property 19: Beautiful Condo steps From both Tamarindo and Langosta Beach! NEW Playa Hermosa Private Villa with Resort Amenities! Property 20: NEW Playa Hermosa Private Villa with Resort Amenities! 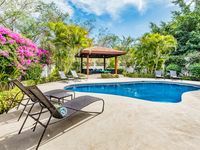 Spyglass House Ocotal "Live like a Millionaire"
Property 22: Spyglass House Ocotal "Live like a Millionaire"
Find your zen or thrills in Tamarindo! Property 24: Find your zen or thrills in Tamarindo! Property 28: Private villa in paradise, breathtaking views. Property 30: Ocean, Beach Casa! Private Pool! Pool Side Palapas! Each Bedrm has Private Bath! Contemporary hillside home overlooking the Pacific Ocean. Property 33: Contemporary hillside home overlooking the Pacific Ocean. Property 39: Casa Vida Loca a tropical gem. Close to the beach. Child friendly. Casa Mirage, Fabulous Oceanfront Location in Playa Grande. Property 42: Casa Mirage, Fabulous Oceanfront Location in Playa Grande. Casa Linda Vista, BEST VIEWS IN MANUEL!! Property 43: Casa Linda Vista, BEST VIEWS IN MANUEL!! Luxury Casita for 2 - Amazing Ocean Views, Toucans, Parrots & Monkeys - Oh My! Property 45: Luxury Casita for 2 - Amazing Ocean Views, Toucans, Parrots & Monkeys - Oh My! Simply the best, incredible views,pool,delicious food and a friend in the area. Property 46: Simply the best, incredible views,pool,delicious food and a friend in the area. Property 49: L@@k! Downtown Samara, only two blocks from the beach! Casa amigos was amazing! Absolutely perfect for our 2 families, with 4 adults, and 6 teenagers. Everyone had their own bedrooms/bathrooms... the home was exceptionally clean... by &ldquo;American standards&rdquo;...... the playa just feet away was pristine and we had it to ourselves... the water was warm, and the waves consistent... the sunsets spectacular... Highly recommend this home. The owner was responsive to the tiniest questions, and helpful in every way. We had a local chef cook a couple of nights. The food was delish, and it was heavenly to get to walk home from The beach, to swim in the pool, while someone prepared our dinner.... The property manager was super helpful in arranging to have a local surf shop bring us surfboards straight to the house..Many evenings we would walk to one of the restaurants nearby for dinner. We felt completely safe, the entire time... The Costa Rican people were delightful, helpful, &amp; happy. Thank you Scott for sharing your beautiful home.. LOVED it!! !